Starting in May, a new art display will be installed at the Yotel Hotel in Manhattan. Artist Matt Whistler of Brighton, England, plans to display his robot art in the hotel lobby alongside the existing “Yobot,” a mechanical arm that stores and retrieves luggage for hotel guests. The Yobot was originally a run-of-the-mill robotic arm used in factory assembly, but Yotel partnered with MFG Automation to adapt it so that it can manage customers’ luggage. Since the hotel already has a robotic theme going with the Yobot, Whistler’s art will fit right in. “I’ve been an artist for 20 years but I’ve never revealed my obsession with robots before,” Whistler said. “When I was a child I used to draw robots using felt tip pens to try to impress my dad. “I’m trying to create the idea of art through recycling. I suppose it is quite a green concept,” he added. Matt Whistler is an established and respected comedian who incorporates a hilarious and unique combination of visual and physical elements within into his acts. He found his way to fame in 2010 when he created his “Surfin’ Bird Christmas No. 1” video to the song “Surfin’ Bird” by The Trashmen. The song was subsequently propelled to the No. 3 spot in the UK. This year, Matt Whistler has been invited to the Cannes Film Festival, where he will contribute to a Troma Productions video about independent filmmaking. The festival will take place from the 15th to the 26th of May. Yotel hotel, where Whistler’s art will be displayed, offers a modern take on the traditional hotel experience; the company has airport hotels situated inside of terminals that can be booked by the hour for busy travelers looking to catch a little shuteye before flights. The hotel has terminal locations at Gatwick Airport, Heathrow Airport, and Amsterdam Airport Shiphol. 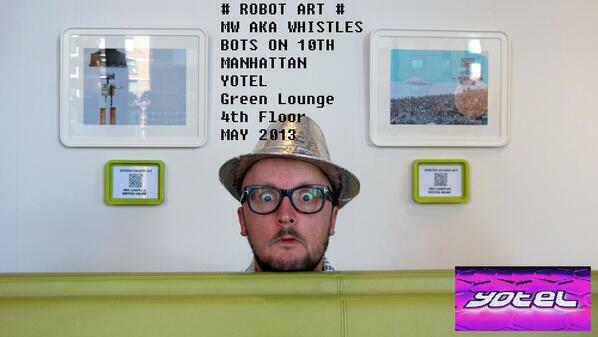 Yotel also has a flagship location (opened in 2011) in New York City, which is where Whistler’s robot art will be displayed. In 2012 Yotel was awarded the LEED Gold certification from the U.S. Green Building Council for green building leadership, which only makes Whistler’s use of repurposed materials fit in even better. 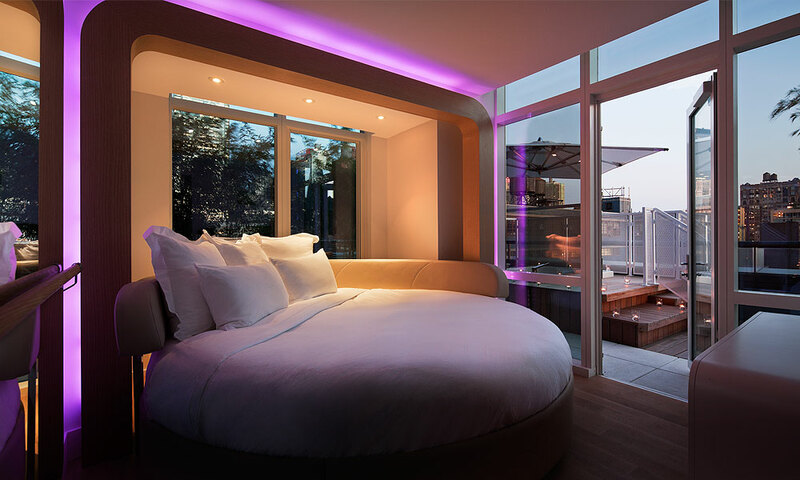 Yotel Hotel in NYC is modern and sleek. The futuristic looking hotel “cabins” at Yotel and the robot art have wonderful synergy, so it’s no surprise that Whistler’s work caught the eye of the hotel chain. Check out Whistler’s website (www.mattwhistler.com) to see a selection of his artwork. A special thanks to Matt Whistler, who helped with several revisions to the original post, which had previously implied that Whistler had designed the “Yobot” and did not give a full background on the artist. Mr. Whistler, I appreciate very much the feedback and helpful insights. 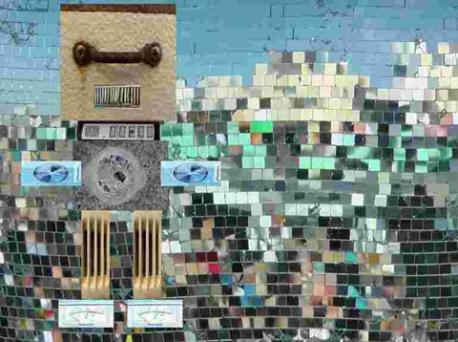 This entry was posted in art, Manhattan, NYC and tagged art, Brighton, comedian, England, green buildings, hotel, Matt Whistler, robots, UK, Yotel. Bookmark the permalink.